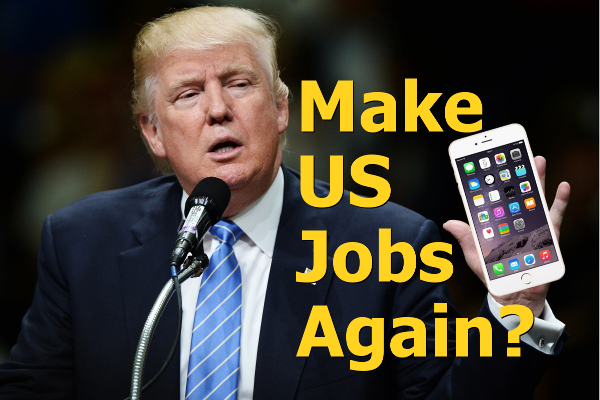 Many analysts laugh when Trump says make iPhones in the USA and expects Apple to move production from China. He isn’t even in office yet & Apple is already talking about it. Is it because of Trump? What does it mean for jobs in the USA? One discovery of Predictive Innovation is a natural progression of technology from Single, to Multiple, and finally to Continuous types. Continuous are Any, All, & None. Automation is a continuous type, no humans or easy enough for any person to do it. As the costs of robots decrease and communication technology improves, robots become available to more people so the work can happen in more places. Foxconn, one of two companies in China that manufacture iPhones for Apple, has cut 60,000 workers from a single factory this year replacing them with 40,000 robots. They have plans to produce 10,000 more robots per year. That means 15,000 fewer employees every year. Apple looking at moving iPhone production to the USA is following the natural steps towards anyone producing anywhere. It is distributed production. When the costs of this technology drop to make it more profitable, Apple and others will distribute some production away from China closer to consumers. This is a different form of globalization. Anyone, anywhere, producing anything for their local consumers. Trump’s proposed lower taxes removes a barrier. In that way Trump could help cause Apple and others to start producing in the USA. Is that good for US jobs? Not really. Is it good for US citizens? It’s great for citizens everywhere, eventually. Foxconn is moving away from human workers to robots. Robots cost less than paying even low wage Chinese labor. That means robots cost far less than US workers. The new production will be heavily automated. It will not create more jobs. It will create some new jobs but overall will reduce jobs. Depending on how we adapt culturally this could be great or it could be terribly painful. People could choose the fun easy path and life would be great. It doesn’t seem like enough people are heading that direction. My concern is people will continue on the painful path until society finally catches up with technology. Even if there are more jobs when they make iPhones in the USA it won’t solve long term cultural problems from the economic changes. Historically these big radical cultural changes require 20-50 years. There isn’t any fundamental barrier, it just tends to be that way. There are reasons for the tendency but those could be changed tomorrow if people wanted. Don’t think this change is caused by automation. The change is a natural progression towards Any, All, & None. Robotics or computerized systems are tools for achieving that result. Those aren’t the only tools. The same result can be achieved in other ways. For instance anything that makes a task possible for anyone to do is an Any type. Making information widely available such as a system of libraries or just a culture of sharing knowledge could do it. If you teach two people a skill then the next day they each teach two more people that skill, all 7 billion people on Earth are trained in just one month. Better yet make the task unneeded, that is a type of None. Incorporating the solution into another part of the larger system is also a way of achieving a type of None. Schools don’t teach the skills needed for this change. The media & politicians don’t promote the values and mindset needed to adapt to this change. As I said there isn’t anything preventing people from changing tomorrow, they just need to know what to do and be willing to do it. I’ve mapped out ways to deal with the changes. Many are low tech. Most require little investment. All dramatically improve life for everyone. There are things Apple can do, there are things China can do, there are things President Trump can do, most importantly there are things you can personally do. My next book covers the biggest future challenge facing all leaders.